"It was my dream to live and work abroad and master another language," says alum Anna Jean Kaiser. Now she is a living and working in Brazil as a reporter. Photo by Lianne Milton. Kaiser covered the Olympics in Rio de Janeiro for The New York Times. Here, she shares what inspired her to move abroad at age 22 and what it’s like working as a reporter covering development, politics, public security, and culture in one of the world’s most exhilarating countries. What have you been doing since you graduated? How did you get to be a stringer for the New York Times and now, the Washington Post? I moved to Rio de Janeiro a few months after I graduated from UCSC in 2012. It was my dream to live and work abroad and master another language. At the time Brazil was an up-and-coming, developing-world success story, quickly transforming into global power, which really intrigued me. I took Portuguese my senior year and I wrote a senior thesis about the rise of the left wing in Latin America. After I graduated, despite a lot of doubt from family and friends, I took a big leap and moved there by myself at 22! 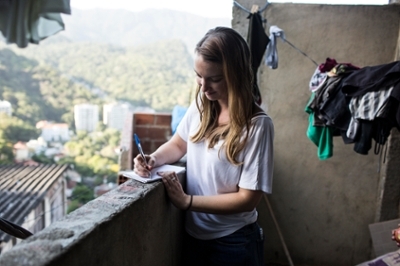 My first gigs in Rio were an internship at a small NGO, Catalytic Communities, and writing for the local English-language weekly newspaper, the Rio Times. Both were great introductions to learning about the ins and outs of Rio and Brazil, and opportunities to build up my clips as a writer. Also, not to mention, these jobs put me in a sink-or-swim situation to learn a new language. That led me to my real catapult into the mainstream media when I started working as an editorial assistant at the Guardian. I worked closely with their Latin America correspondent just as Brazil was really coming center-stage in international coverage with the lead up to the World Cup. It was an excellent opportunity to learn from a long-time foreign correspondent, who really showed me the ropes of international reporting. 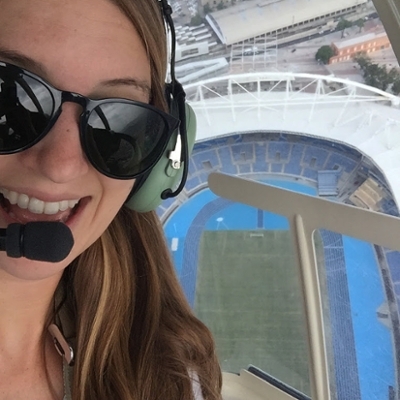 After a hiatus back in the Bay Area for part of 2015, I returned to Rio at the beginning of 2016 and started working as a freelancer for The New York Times. This was at the onset of the Zika virus, an escalating political crisis, a tanking economy, and the Olympics looming in the near future so it was quite the time to be a reporter in Brazil. I worked on day-to-day coverage with the bureau chief based in Rio and also with visiting reporters on bigger feature stories ranging from the cultural significance of Brazil’s soap operas to Brazil’s messy, fragmented Congress. I worked for the Sports Desk during the Olympics (which got me an all access press pass!) working with a team of 35 visiting NYT staff in Rio to cover the Games. I also wrote/co-wrote two stories that landed on the front page: one about sexism in the former president’s impeachment process and another about the unfulfilled promises of the Olympic Legacy. 2016 was a huge year of news in Brazil, and without a doubt was a really exciting time to work with the New York Times. After the Olympics, I started writing more features about culture and human interest for a range of clients, including one article for BuzzFeed News about a Brazilian model who was the first transgender person on the cover of Vogue. Most recently, I started stringing for the Washington Post to help cover breaking news and write feature stories. What was it is like covering news and events in Brazil? Brazil has been so central in the international media, especially in 2016, for a wide range of reasons–from the political and economic crisis, to Zika and the Olympics plus all the turmoil in the lead up. Unlike reporters with a more defined “beat,” international and freelance reporters often have to pivot quickly from one topic to the next. Between last summer’s Olympics, Zika, and now the upcoming presidential election, Brazil is in the news a lot these days. What do you think is missing from the conversation in mainstream media? As a reporter on the ground, do you think there any misconceptions in American news? Brazil is a huge country (bigger than the continental US in land area), It’s packed with natural resources and is consistently in the top ten largest economies so its place in the world matters. The mainstream media oftentimes doesn’t realize how incredibly diverse Brazil is, both in population and geography. São Paulo and Rio are cosmopolitan business capitals, with skyscrapers as far as the eye can see, while the thicket of the Amazon is thousands of miles north and still contains isolated, indigenous tribes that have never had contact with the outside world. In terms of demographics, Brazil shares a lot of parallels to the US: it’s a continental-sized country, colonized by Europeans who brought over slaves, (about ten times more than in the US! ), and later took in millions of immigrants from Europe, Asia, the Middle East and Africa. So like Americans, anyone can “look” Brazilian. And there’s evidence of this diversity everywhere, for example São Paulo has the largest Japanese population outside of Japan, there are hints of African and Middle Eastern cuisine in popular Brazilian foods, and more than half the population identifies as mixed race/black and this melting pot has its own rhetoric and tensions surrounding race and identity. Also, in favelas (informal settlements), sometimes mainstream media feeds negative stereotypes and reports on them as squalor, mostly occupied by drug addicts, drug lords and criminals. While many favelas face a complex set of problems, in reality the vast majority of residents are working class families who are proud of their homes and communities. What are some of the challenges you face a reporter? Getting access and information can be difficult. There is a lot of red tape and bureaucracy on seemingly simple things. This can be especially tricky when navigating between two cultures, since all my clients are North American and European. Sometimes they think it should be easy or straightforward to get a certain piece of information or an interview, but I end up down a rabbit hole trying to get it. Fact checking is a challenge all reporters face in the digital age because there’s such a wealth of information (which can be fake or embellished). If you read about a study or see a statistic in a newspaper, a post, a blog, sometimes finding the primary source is difficult–sometimes it doesn’t exist! What advice do you have for students who want to pursue a career in journalism? Focus on something you are specialized in and where you have an edge whether it is a language you speak, contacts you have, or a deep understanding of a subject. If you’re studying biology or astronomy, consider starting in science writing, or if you’re studying feminist studies, take advantage of the increasing coverage of women’s issues all over the world. Or if you love technology and are the kind of person who always keeps up on the latest apps and gadgets, there’s a big market for tech and business journalism, especially in the Bay Area. Moving abroad and learning the local language, like I did, is a great way to set yourself apart. Or if your family is from another country and you are a native speaker, even better. Think about countries that are in the global spotlight for some reason, whether that is because of an emerging economy, a huge international event (like the World Cup and Olympics), or if it’s a conflict zone. Start by pitching ideas to local or student newspapers, blogs, anywhere so that you can build up a few “clips” (published work examples) and build clients from there. What was your biggest takeaway at UC Santa Cruz? Is there anything you wish you would have done differently? My biggest takeaway at UC Santa Cruz was being exposed to global issues—between my classes, the language department and studying abroad. Classes like Latin American Politics, Nuclear Policy, Post-Communist Politics, Social Movements of Central America, fed my dream of working with international issues. My professors spent significant time doing fieldwork in these places and wrote the books we read in class and that was something I really looked up to. Plus, the politics degree required a lot of writing, which was great practice for going into a writing-intensive field. I also took advantage of study abroad opportunities. I did a Semester at Sea and also studied in Spain through the UC EAP program. And beyond my major, a huge takeaway for me at UCSC was the language department. I studied Spanish up to the highest level and my senior year I started taking Portuguese, which has opened so many doors for me–I couldn’t imagine my life without it! I wish I had taken advantage of UCSC’s world-renowned feminist studies department! Some of my favorite reporting has been on women’s issues.